The “Seven Royal Symbols” (Tib. Gyalwae rinchen nadün) of the Chakravatin kings together with the “Great Treasure Vase” (Tib. 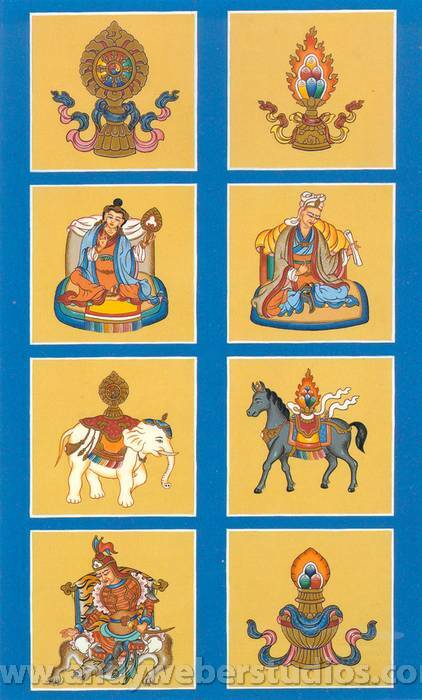 Ter chen.poi bumpa) form the eight precious offerings – precious wheel, precious jewel, precious queen, precious minister, precious elephant, precious supreme horse, precious general and great treasure vase – part of the mandala offering.